Check out these healthy Easter ideas to make the most of your holiday. So, Easter is one of my favorite holidays. But, it’s not because of the baskets full of Easter candy. I love the theme of spring and resurrection and new beginnings. Finding healthy Easter ideas can be a challenge. It seems like a lot of the focus of Easter is Easter dinner and Easter candy. While I certainly enjoy jelly beans as much as the next person, I try not to let it get out of hand. If you’re searching for Easter gift ideas, there are several things you can give that don’t involve candy. We often give an Easter plant. The Easter lily is traditional. It symbolizes hope, purity, innocence, virtue, and life. When the kids were little, we tried to focus on a few small gifts along with a little bit of Easter candy. They typically got a Bible that was more suitable for their age as they grew up. We also added a small stuffed rabbit or chick and some crayons and coloring books. Now that they are older, they get a gold foil-wrapped chocolate bunny. Having a healthy Easter dinner doesn’t need to be difficult. It’s not so much what you eat as how much for many people. Since my mother is now watching her sodium, they are having a pork roast instead of ham. If you’re watching calories, consider baked potatoes instead of mashed. You can try my easy roasted asparagus recipe as a side dish. If the kids are little, head outside for an Easter egg hunt to burn off some calories. To get everyone moving, add a different type of exercise on a slip of paper inside each Easter egg. Or, if the kids are older, you can take a long walk after dinner. Skip the dye tabs that come in traditional Easter dye kits. The dye can leak through the shells onto the egg itself. There have been many studies linked to behavior issues with artificial food coloring. Did you know that you can use onion skins, turmeric, beets, and purple cabbage to dye your eggs? Learn how to dye your Easter eggs with natural dyes. Now that the kids are grown, we are focusing more on spending time with each other at Easter. We have a simple meal and spend time talking and enjoying the time we have together. The kids each get the traditional chocolate bunny. And, we go for a walk after dinner to check out the signs of spring. 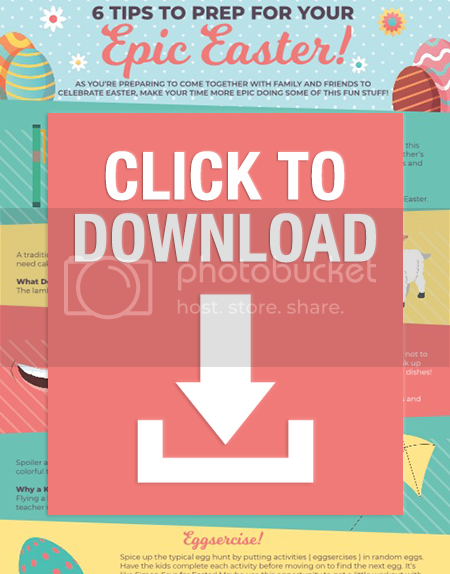 Check out the graphic for some fun ideas to help you celebrate Easter. 1- Wicker Basket w/Cutlery, Plates, 2 Wine Glasses, Tableware, Fleece Blanket and more!